I've said it so many times I'm sure y'all are sick of it...but we LOVE books in my house. So I was super excited to see this great deal and I wanted to share it with you immediately! This is so cool. You get an awesome selection of books for 55% off! You pay ONLY $14.99. Ten classics for the whole family to enjoy. The Weekly Reader Editor's Choice Classic All-Star hardcover book collection includes favorites that can be passed down from generation to generation. 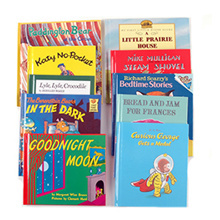 Enchant your children with tales like Mike Mulligan & the Steam Shovel, Curious George Gets a Medal, The Berenstain Bears in the Dark, Goodnight Moon, and many more. Click here to purchase your set now. Be sure and hurry because this deal will NOT last long. Thanks to Saving Dollars and Sense for sharing!